Greece has more than 2500 islands and 165 of them are inhabited. Summer in Greece is warm to hot and this makes the islands a perfect destination for summer holidays. Some of the islands are more touristic and others are quieter, so the visitor can choose from a big range according to his needs. No matter which one you choose, you will enjoy the pleasant weather, the transparent waters and Greek hospitality. Among the plethora of Greek islands, there are 3 of them that could be described as small gems: Mykonos, Paros and Santorini. Each one has its own beauty and character but they all are chosen by thousands of visitors each year. Mykonos is the favorite Greek island of international celebrities. Not long ago, it was just another fishermen island in the Aegean Sea – until rich and famous travellers discovered its natural beauties. Today, Mykonos has become one of the most luxurious summer destinations. Mykonos has more than 30 beaches and most of them have golden sand and are well protected from the winds. The famous southern party beaches – Paradise, Super Paradise, Paraga and Psarou – are all very organized but sometimes they get overcrowded. Other beaches like Elia or Panormos are also sandy and partly organized but accept fewer visitors and are more suitable for guests who prefer a more serene beach. 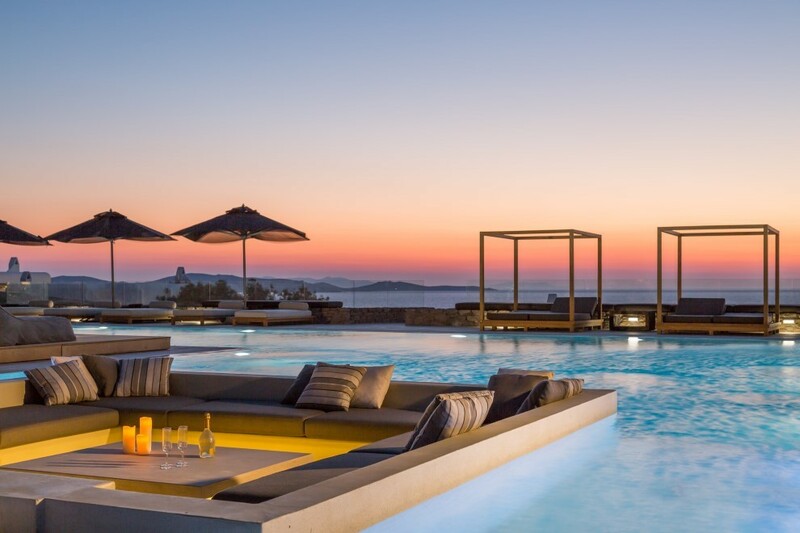 Luxury accommodation has become a part of Mykonos lifestyle. Mykonos Luxury Villas are the most lavish places to stay and they offer a lot of amenities and privacy. VIPs usually choose a Mykonos Villa by MLV, the leading villa company in the island for their accommodation. High level luxury can also be found in one of the many 5 star hotels of the island. The bigger ones have their own restaurants, beach bars, private beaches, boutiques and spas, so that their guests can find anything near them. Another very touristic island in Cyclades is Paros. It also has many beautiful sandy beaches, warm climate, beautiful whitewashed houses and great nightlife. The two most visited areas in Paros are Parikia, the capital and main port of the island, and Naoussa or Agoussa. They both are built at the seafront, have a good nightlife and a lot of places to see. At Naoussa don’t miss the Venetian castle, built during the 13th century, and the Aqua Park, accessible only by boat leaving from Naoussa every hour. Naoussa is the center of nightlife in Paros with a lot of clubs, bars, restaurants and cafes. At Parikia you can visit the Archeological Museum of Paros, the Castle and the Church of Panagia Ekatontapiliani, one of the most famous Greek churches. The main seaside road has a lot of traditional taverns with fresh fish and nice views, while the central market road has many small or bigger shops with traditional products and souvenirs. Santorini is rich in different landscapes and full of colors. Fira, the capital, and other villages are built on the top of steep cliffs, offering astonishing views to the Ocean. Nightlife is intense with many clubs and bars and the island accepts thousands of young visitors every year. The reason for Santorini’s special geography is the active volcano located on the islet of Nea Kameni, which had its last eruption in 1950. At Palia Kameni the sea waters are warmed by the volcano and you can have a natural spa just by swimming there. Santorini beaches are either sandy or rocky in different colors and they easily get overcrowded as tourists seem to love the island. Some of its most famous beaches are the Red Beach, the White Beach, Vlychada, Perivolos, Kamari and Perissa. Oia is said to have the most spectacular sunset and Foinikia is a colorful village with blue, pink and green houses.